this piece was composed very slowly over the course of 2 years; part one came first – inspired by the hypnotic rhythm of the ancient gas meter in my basement – and was then left alone for about a year. finally, with a desire to reuse some old telephone feedback recordings that had been made for a composition that I hadn’t been happy with, the prologue came into existence, and then, much later, the longer conglomeration of parts two, three and four. i mastered these as a single track as, while they are three distinct parts, they do not have distinct transitions, blending slowly from one into the next. the piece shares many of its elements with the live soundtrack to the show K.A.., which I have been performing over the past year (2003) with the french performance company urba. the earlier parts were completed when rehearsals began, and were integrated into the show, and much of the latter work came directly out of the rehearsal process. After a handful of tiny CD-R editions, Patrick McGinley (aka Murmer) has graduated to a proper CD production for his latest excursion in to phonography, manipulated field recordings, and the amplified minutiae os environmental sounds. As previously, McGinley states to source material for each of his compositions (car seat massager, gas meter, the Brooklyn Bridge, Turkish football victory celebrations, water tank, etc. ), almost daring listeners to trace back these sounds buried within his looped samples, delay pedal feedback, and ghostly reverb. He’s at his best when the sources intertwine, rather than situate on top of each other, as during the beautiful passage at the end of the album, where an angelis chorus hovers over aerated drones that slowly reveal themselves to be distant carhorns gleefully wailing in an avalanche of reverb. Murmer is Patrick McGinley. The list of (altered) sound sources used as base material is intriguing: car seat massager, gas meter, elevator shaft, ringtone, airplane cabin, Turkish football celebrations, etc. Not that many of these are at all recognizable, because they generally aren’t, but the most successful portions of his disc occur when the environmental and/or industrial elements creep in relatively unadapted. McGinley claims inspiration from devices such as rhythms generated by the old gas meter in his basement and, indeed, “Part One” fairly chugs along with a rough and insistent beat augmented by a whistling drone (the massager?) and several other layers of ephemera. The final, longest track, clocking in at 43 minutes, achieves a very nice blend of open, spatial sounds with tense, discomforting needles of noise. Strident telephone tones, stuttering static glitches and metallic whines interact in a manner that will either fascinate or entirely off-put, depending on the listener’s taste and tolerances. While I have no problem with its shriller aspects, I did find myself resenting the occasional burbles of tonal notes, sounding a bit like someone noodling on an old Casio. Gradually, the piece coalesces into a drone that indeed has some of the characteristics of an airline interior, an airy, tubal hum. It’s embroidered with choir-like wafts and faraway urban rumbles but oddly flits in and out of interest, sometimes compelling, other times just…there. “they were dreaming they were stones” certainly has its dreamy facets and about half of its hour plus is quite stimulating. I’m curious to hear where McGinley goes from here. Slowly Murmer builts an interesting body of work based on field recordings. This must be his first real CD after a couple of interesting CDR releases for Bake, Absurd and S’Agita. 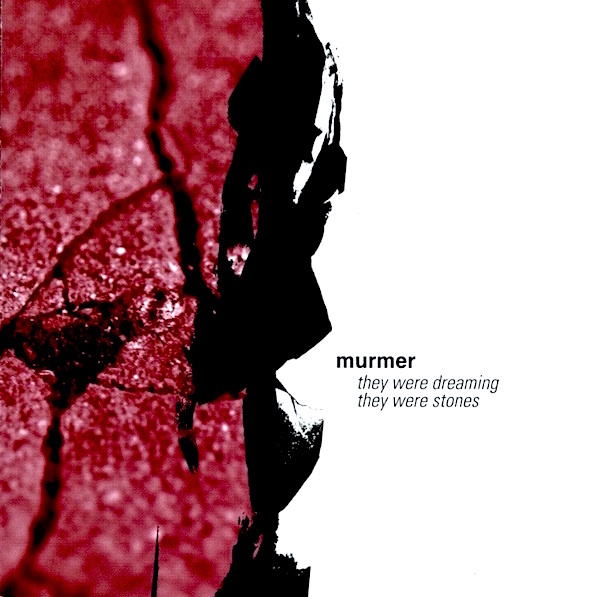 Murmer, aka Patrick McGinley, records sounds in his environment and puts them on his four track recorder and builts sound collages out of that. Rather than investigating and processing the sounds he uses the sounds as they are. While mixing these seperate sound sources, he adds a little bit of sound effects, but not much. His sources include a car seat massager, telephones, airplane cabin, a 600 gallon galvanized steel water tank but also the brooklyn bridge. For some reason this CD has three tracks, one is called ‘Prologue’, one is ‘Part One’ and the final track, the longest, is ‘Part Two, Three & Four’. In ‘Part One’, McGinley even manages to get a very minimalist rhythm out of his sources. McGinley goes for the overal minimal approach in these pieces. Dense, layered fields of sound recordings go over each other and form a mass of slowly moving ice, especially in the final piece. Slowly moving and changing shape over the course of some time. Great ambient music made out of daily sounds. I’d say his most refined moment so far.